HERSHEY - Caleb Garland couldn’t bear to watch. The Hanover wrestler had just been called for an illegal slam in his District 3 Class AA championship bout. He clasped his hands behind his head, walking away from a prone Gabe Miller. Had Miller not been able to continue, Garland would have had to settle for second place in the 126-pound weight class. But the Pequea Valley grappler continued and Garland responded with a convincing 14-3 major decision to claim the gold medal. 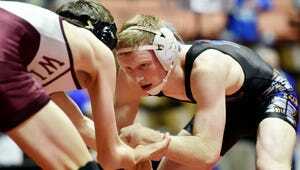 Nate Newberry of Biglerville was the only other YAIAA wrestler to capture a district title Saturday in Hersheypark Arena, defeating Brian Shermeyer of Delone Catholic, 16-4, in the 152-pound final. Bringing home silver medals along with Shermeyer were Bermudian Springs’ Austin Clabaugh (120), Biglerville’s Scott Cooper (145), Eastern York’s Dakota Mackley (170) and Littlestown’s Connor Geiman (182). Northern Lebanon took the team title, knocking off defending champion Boiling Springs, 198.5-158.5. Bermudian Springs finished a distant third with 119 points. Another 11 league wrestlers earned top-five finishes Saturday afternoon and will join the seven finalists in next weekend’s PIAA Southeast Class AA regional championship at Wilson High School in Berks County. Leading 2-1 with 45 seconds left in the opening period, Garland picked Miller up off the mat and was bringing him back down. When Miller hit the mat, the referee stopped the action for an illegal slam. After being checked out by an athletic trainer, Miller continued and Garland turned up the heat, racking up seven back points in the remainder of the first period. Garland, who improved to 34-4 with the win, coasted from there, tacking on atakedown in the final seconds. Brenner credited Miller for continuing to wrestle during a time in the sport when people are more willing to take the easy win. “(Miller) was definitely banged up but it is a testament to the kid how he toughed it out. He came back and competed well,” he said. Newberry found himself in a replay of last week’s sectional final against Shermeyer, won by the Biglerville wrestler, 4-0. This time, the defending district champion left no doubt who would leave Hershey with the gold medal. In the second period of a scoreless match, Shermeyer attempted a sit out, and Newberry snapped him backwards. Unfortunately for the Squires junior, he hurt his shoulder when his arm was caught in an awkward position. In the third period, Newberry registered five takedowns over a hurting Shermeyer (29-7) to stretch the difference. Shermeyer had earned his finals spot with a big upset in the semifinal round, knocking off Brandywine’s Hunter Gimbor, 1-0. Gimbor came into the match 33-1 but needed to win a consolation bout to place third. The other Biglerville finalist, Scott Cooper, was also in a rematch from last weekend. And again it was a third-period takedown, this one midway through the final two minutes, by Boiling Springs’ AJ Kostyak that was difference as the Bubblers senior took the crown with a 3-1 decision. Kostyak had beaten Cooper (30-8) with a last-second takedown in the sectional tournament. Clabaugh dropped a 7-3 decision to 2015 state runner-up, Joe Lobeck from Lancaster Catholic. The Eagles underclassman was trailing by just one point with time running out in the second period when the Lancaster-Lebanon competitor hit a double-leg takedown in the final second. Geiman (32-5) ran into a buzzsaw in his 182-pound final against Northern Lebanon’s Luke Funck. The Vikings junior scored the first takedown of the match just 13 seconds before clamping a tight cradle on Geiman to register the fall in just 45 seconds. Mackley didn’t fare much better against Funck’s teammate, Quinn Blatt, in his 170-pound final. After holding his own in the first period, the 24-3 Golden Knight senior gave up eight points in the second period and six more in the third on the way to a 16-4 loss. Littlestown's Matt Guilday saw his career come to an end in unfortunate fashion as he was taken off the mat on a stretcher after a serious ankle injury against Matt Vines of Northern Lebanon in a 220-pound semifinal. Six Bermudian wrestlers will join Clabaugh at next weekend’s regional tournament — Landon West (third place at 106), Darren Beall (fifth at 138), Ashton West (fourth at 145), Noah Fleshman (third at 170), Logan Luckenbaugh (third at 195) and Brady Linebaugh (third at 285). Delone Catholic teammates Brady Repasky (182) and Bryce Perkins (285) each placed fourth. Coming through with victories in fifth-place matches, and keeping their seasons alive for at least one more week, were Littlestown’s Carl Harris (145) and the Biglerville pair of Colton Sentz (182) and Victor Lopez (195).